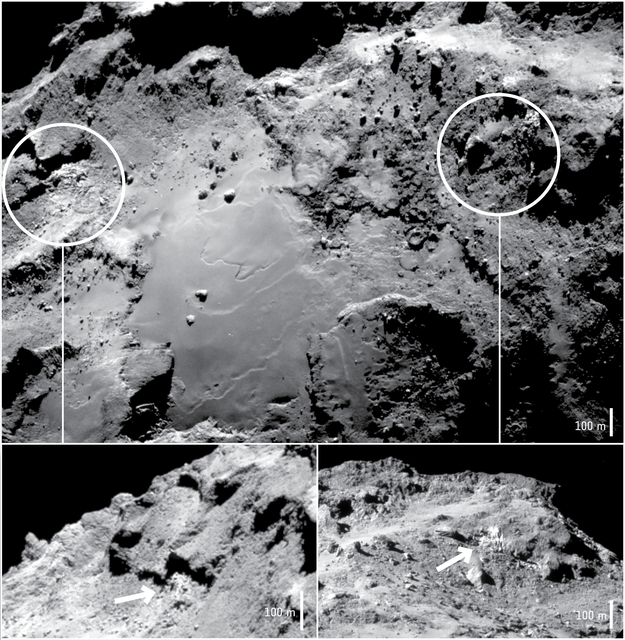 Two exposures of water ice identified by Rosetta's VIRTIS instrument in the Imhotep region of Comet 67P/Churyumov-Gerasimenko in September–November 2014. The main image was taken on 17 September 2014 from a distance of about 28.8 km from the comet centre. The two insets show oblique views of the two icy exposures. The left hand image was taken on 20 September 2014 from a distance of 27.9 km. The right hand image was taken on 15 September 2014 from a distance of 29.9 km. The image contrasts have been enhanced to better reveal the icy regions.